Avowed leftist and socialist presidential candidate Rodrigo Duterte has not won yet, but if the poll surveys will translate into votes, then expect a coalition government with the Communist Party of the Philippines (CPP) starting 2016. Duterte has been open about his association with the CPP and National Democratic Front (NDF), commonly known as NPAs or communists, even before he became a candidate for president. He said that if he becomes president of the country, he will end the war against communists. Davao Today quoted him as saying," I will form a coalition government with them [CPP]. I will accept their top officials if I’ll become the President. We just need to agree on some issues. I will take control of the AFP-PNP to avoid chaos as we are working on how to address the problem and find the appropriate solution." That statement was made way back December 2014, when people thought he did not have any plan to run for the presidency. Duterte has not changed his stance since then. Something which his ex-Professor Jose Maria "Joma" Sison, the top honcho of the NDF and founder of CPP, is excited about. Joma Sison has been in exile for the past 30 years. But should Duterte win, he promises to come back home and work out key agreements with Duterte's government. This early, Joma is dreaming of Filipino food especially mangoes, coconuts, and bibingka. The student and his ex-professor talked on Skype on April 25, with Joma saying that with Duterte, the country will have a government that is for national unity, peace and development. Joma wants mobilization of workers and farmers as a democratic force. He also pointed out that economic development can be achieved through national industrialization and land reform. Joma said that if there's cheating in the elections, there's a basis for the communist party and Duterte's camp to meet and unite to fight against the cheaters. For his part, Duterte said that he will follow the pattern of socialism. He also told told Joma that he had said in public that he is a socialist, but not a member of the communist party. He also said that if he wins, this will be the first time that the Philippines will have a leftist president. He also expressed his hatred towards oligarchs and rich people who he said, "get the fat of the land" and are allowed billions in tax exemptions. 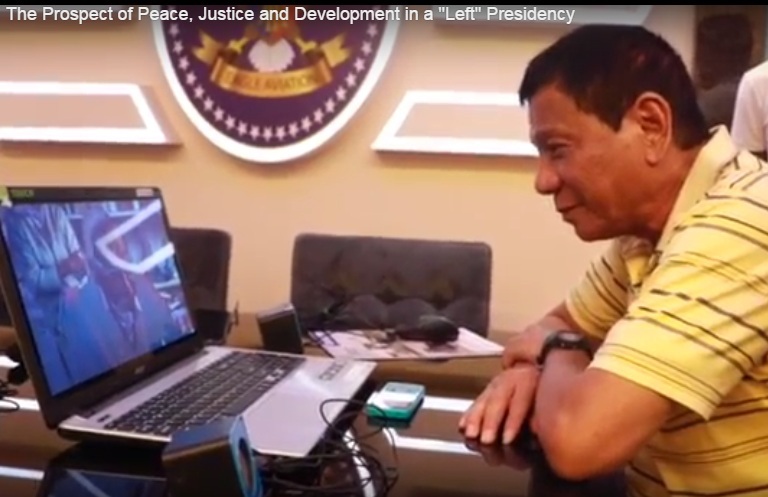 Towards the end of the Skype conversation with Joma, Duterte wished him well. "All the best for you, mga kasama natin diyan (and our associates there). And hopefully I will visit you there before I assume office," Duterte told Joma. He said they have to meet to prepare the agenda, so there will be no debates or issues unresolved. Poll surveys still puts Duterte ahead of everyone among presidential aspirants. If he wins, then get ready for a socialist style of government. Out with the yellow shirts, in with the red?